What is the benefit when using CanadaUnlocking.com services? Step by Step How to Unlock iPhone from every Carrier in the US, UK, Canada, Australia etc. Your iPhone is usually locked to the original carrier that it was purchased from. If it was purchased from an Apple store, then it is normally locked to the carrier of the first SIM card that you originally activated the phone with. Unlocking your iPhone refers to network or carrier unlocking which means that once unlocked, you can use your iPhone with different carriers. Contact your carrier, if you have no outstanding balance left on the phone or are willing to buy it outright then they are often able to unlock it for a nominal fee and sometimes even for free. Make sure the iPhone is not iCloud Locked or Activation locked by. To do that Tap settings -> [your name] -> Scroll down and Tap sign Out. Enter Your Apple ID password and Turn OFF. * Only if the above is resolved, can you can safety proceed to release your iPhone using our unlocking service. Is it Legal to Network Unlock an iPhone? Unlocking your iPhone is completely legal in all the Countries that we have checked however it is always possible that laws can be changed. If you are still financing the phone through your carrier then technically they still own the phone until you pay for it off completely. In that case you're carrier may not want you to unlock it for they fear you will run away to another carrier without actually paying the remaining balance owed on your iPhone! If you bought the iPhone second-hand or got it from a friend then you may not be sure If your iPhone is locked or not, the simple way to find out is to pop in a SIM card from a different Network. If it's locked, then the iPhone won't work on that network. If it works then you can be sure that the iPhone is unlocked and not blacklisted. However if it does not work with a SIM card from a different carrier, this can also mean that it is blacklisted. You are better off spending a dollar or two and purchasing a Blacklist Checker, iPhone carrier checker and GSX report just to be sure. If you discover that it definitely is locked, and not blacklisted then we can help you network unlock the iPhone . Instead of contacting your carrier and asking them unlock the iPhone you can use the 'Canada Unlocking' iPhone unlocking service. We promise a full refund if in the rare case we are unable to unlock the iPhone successfully. To date, we have thousands of happy customers from all over the world. Please feel free to search online for our reviews. A successfully unlocked iPhone is completed when we whitelist the IMEI number in the Apple database, this is the same method the carriers use! Back up your iPhone using iTunes . When you have a backup, erase your iPhone. When you see the Welcome screen, connect your device to iTunes. After the RESTORE process is complete, you will be prompted to update your NEW carrier settings.Click the "UPDATE SETTINGS" button. The Message will be displayed: "Congratulations, your iPhone has been unlocked"
*In some cases, to get Data & MMS to work on the new carrier you would need to update your APN settings after the iPhone is unlocked. **Also in some cases iTunes will not display the "Congratulations, your iPhone has been unlocked" message, don't worry, it may still have gotten unlocked. Insert a SIM card from a a different carrier and see if you can make a phone call. If you can, it means the UNLOCK is completed successfully. ***If it doesn't work, redo the steps above on a different computer or using a different Original APPLE cable. More iPhone unlocking troubleshooting iPhone unlock steps are available! How does the IMEI iPhone Unlock process work? With our process your phone’s IMEI will be whitelisted on the network database as well on the Apple database. You will receive a message via email, and you can use iTunes to remove the SIM lock. On newer iPhones, all you need to do is connect to Wi-Fi and get an OTA (over-the-air) update that removes the iOS lock on your device. The process is simple and easy. And it’s faster and less expensive than most of the other services out there. Your unlocked iPhone is now permanently untethered from the network carrier. You can still use the same SIM, ofcourse, however you are now also able to use other carrier SIMs as well. If you upgrade your iOS version, re-install your OS or do a factory reset, the device will remain unlocked. This is the biggest reason to choose canadaunlocking.com’s iPhone unlock services. To unlock an iPhone is as simple as that. Here are some popular iPhone unlock services we offer: Unlock iPhone from Orange, Unlock iPhone from T-Mobile, Unlock iPhone from Movistar , Unlock iPhone from Claro , Unlock iPhone from Canada, Unlock iPhone from Three, Unlock iPhone from USA, Unlock iPhone from Australia, Unlock iPhone from Vodafone, Unlock iPhone from Ireland, Unlock iPhone from UK, Unlock iPhone from AT&T, Unlock iPhone from Rogers, Unlock iPhone from Telcel, Unlock iPhone from Yoigo, Unlock iPhone from Bell, Unlock iPhone from Telus, Unlock iPhone from Fido, Unlock iPhone from MetroPCS, Unlock iPhone from Verizon, Unlock iPhone from Unlock iPhone from Sprint, Unlock iPhone from Cricket, Unlock iPhone from CSpire. Official iPhone unlock services mean that the IMEI is unlocked through the Apple database method and the unlocking is completed through iTunes. The first method for unlocking your iPhone,is a Factory unlock by IMEI which is done when the request from your carrier or a 3rd party unlocker such as CanadaUnlocking.com, the iPhone Unlock is done by whitelisting the IMEI number in the Apple database. This is usually the best solution as it is an official unlock from Apple however for some Carriers it is either very expensive or unlocking is not available at all. When you Factory Unlock your iPhone by IMEI method it is unlocked forever and you can update to new iOS versions, without worrying whether it will affect your unlock or not. IMEI stands for International Mobile Equipment Identity and it is a string of numbers which Apple uses to categorize iPhone’s as locked or unlocked. The iPhone Unlock Chip Method of unlocking an iPhone involves purchasing a passthrough card or SIM interposer. 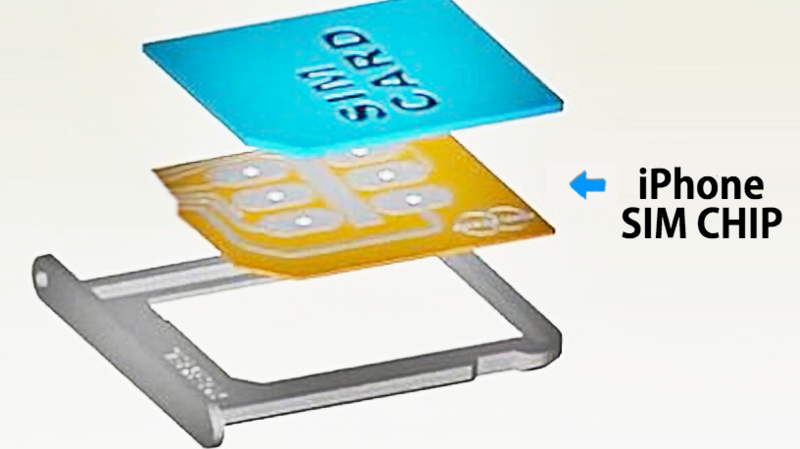 You purchase one of these special passthrough cards that essentially sits on top of your SIM card. In order to maintain this sort of unlock you must always keep the card between your SIM card and SIM card tray. This method of unlocking has become more popular because our new Unlock Chip now supports the latest iOS versions, functions perfectly, it is less expensive and you can always use this same chip on other iPhones. For example if in the future you buy a new iPhone or get your iPhone replaced by Apple then you can remove the CHIP from your old phone and place it into your new phone easily. Some older Sim Chips were known to have issues, meaning they would suddenly stop working or they would not support all of Apples features such as iMessage etc. CanadaUnlocking.com is happy to have released the latest iPhone Sim Chip which works with all iOS versions. It is the smallest and most powerful unlock chip to date, it has been rigorously tested and has proven to be the most reliable chip ever made. To put our money where our mouth is, we are also offering a 3 month replacement warranty on them. Also it supports all of the iPhones great features such as iMessage. To date there is no noticeable difference in features between our sim chip and a Factory unlock by IMEI. The unlock by SIM chip is also called a Hardware unlock. It has become a very popular option since our latest updated software allows the iPhone to be unlocked seemlessly. We are even able to update the SIM chip on your own so that in the event of a future iOS unlock the phone would still work on other networks. Recently we have made a new discovery on Apple’s iOS platform which allows any device to be factory unlocked to any network by using our SIM chip and directly modifying the ICCID. Once unlocked, the device will still continue to work, even when the SIM chip is removed, still allowing you to use any network’s SIM card. Best of all, it doesn’t require jailbreak to work, and is compatible with all iPhones (including the X) and works up to iOS 11.4.1 as well as iOS 12 and later updates. If a future update becomes incompatible, then simply re-insert the SIM chip and change the ICCID number. Simply contact us for this new ICCID number in the future if needed. Now your iPhone has been unlocked by the SIM chip method. We should also mention that this isn’t entirely permanent and if you do a factory reset the device will be locked again, but that's not a real problem since you can just insert your SIM chip in again to unlock it. Which iPhone Unlocking Method To Choose? Essentially you have two options when it comes to unlocking your iPhone. The iPhone Unlock Chip Method (The Passthrough card/SIM Interposer) is indeed recommended because it is cheaper, & it can be used on other iPhones as well, however keep in mind we can't guarantee compatibility with future iOS updates. If you have chosen the SIM Unlock Chip then place your order on the Top of this page. Please note, that the chip will be physically mailed by USPS to your confirmed paypal or credit card billing address. Typically, the card is mailed out within 48 hours, and depending on where you live it should arrive by regular mail (USPS) within 2-14 days. Rural areas make take a little longer. 100% Guaranteed to Permanently Factory Unlock your iPhone. Your iPhone will remain unlocked even after updating firmware. Simply plug your iPhone into iTunes when you receive our E-Mail and your phone is unlocked! Please select the network your iPhone is currently locked to. If it is not listed in the networks below, DO NOT order it as another network! If you are not sure of your Network, please contact us first. Also Please make sure your iPhone has been activated first with the Network it is currently locked to. (You must be able to access the home screen of your iPhone).